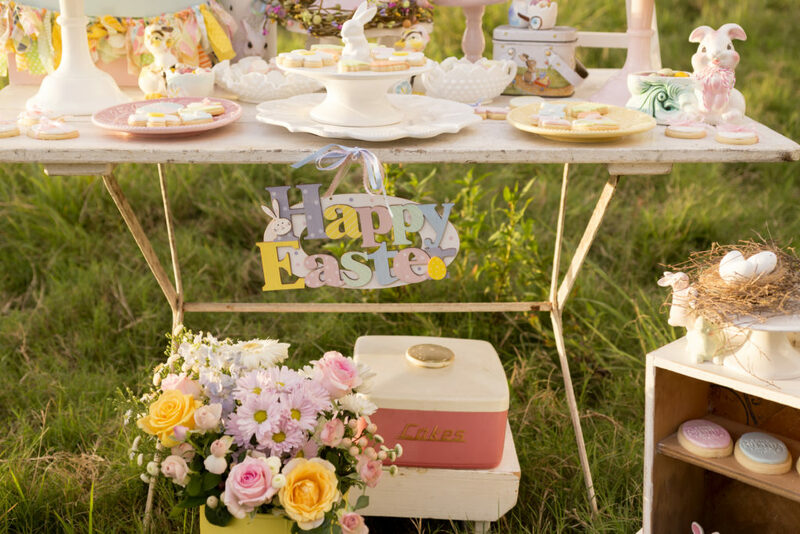 Easter is a party stylist’s dream theme. Images of pastel sugar cookies, pretty buttercream cakes, vintage florals and decadent chocolate eggs fill our imaginations and tantalise our taste buds. The colour palette alone is enough to make any party planner swoon. Baby blue, mint green, lemon yellow and soft pink – pastel heaven. My mind is constantly bursting with dessert table ideas and I was delighted to bring this one to life. I confess the inspiration for my vintage Easter shoot was the location. I drive past this paddock regularly and always daydream about setting up dessert tables there. A local farmer gave me permission to do a photo shoot on his property and I knew I wanted it to be a complete contrast to the environment. Hence my vintage pastel Easter shoot was born. I set up a single dessert table on a distressed white timber table, with three buttercream feature cakes taking centre stage. These were joined by lemon meringue cupcakes, decorated sugar cookies, sweet meringue bites, chocolate covered Oreo Easter nests and mini Easter eggs of course. All treats were displayed in cute vintage dishes and pastel Mosser glass cake stands from my collection. To add texture and colour I tied scraps of bright pastel fabric to make a tiny garland which was wrapped around a cheap box I found at a discount store. The colour palette was inspired by an inexpensive “Happy Easter” sign I found in a supermarket. Its colours were perfect. Just the right shade of pastels that I like to work with. Stylish dessert tables and parties do not need to break the budget. Often you can find a cheap decor item or fabric that inspires an entire colour palette or theme. By using what you already have, and bringing in a few key elements, you can transform any dessert table into something special. To add more interest I set up a few vintage pieces on the ground in front of the dessert table. I cobbled together some old books painted in pastel pink and blue, tied with contrasting ribbon and put them on top of an old shabby white crate. My pastel pink teapot was perfect to use for a vase of pretty flowers. Think outside the box when it comes to vases. Teapots, teacups, old tins and cans, retro kitchen canisters…the possibilities are endless when it comes to flowers. Just about anything works, and will add a touch of quirky to your display. Undoubtedly the stars of the show were my sweet models. Two of my daughters were happy to oblige (naturally, if chocolate was involved!) and a dear young friend of ours. Keeping with my signature vintage theme I gave them all lace headbands, white dresses and a couple of vintage aprons from my collection. Our afternoon together was made even more memorable as the sun began to set and a gorgeous rainbow threw itself magically over our gathering. It was truly an event that Easter dreams are made of. Follow Anna’s adventures via her blog, or on Instagram.